Chrome vanadium steel blade ensures greater hardness, strength, and durability. Chrome plated blade with magnetic tip. Soft rubber grip provides greater comfort and control. Standard fluted light blade/cabinet tip made of alloy steel nickel protected blades for long life and hardened tips for slip-resistant fit. Ergonomic grip. Fluted, standard blade and tip made of alloy steel nickel with hardened tips for slip-resistant fit. Ergonomically handle for comfortable grip. Chrome vanadium steel blade ensures greater hardness, strength, and durability. Chrome plated blade with magnetic tip. Soft rubber grip provides greater comfort and control. Chrome vanadium steel blade ensures greater hardness, strength, and durability. Chrome plated blade with magnetic tip. Soft rubber grip provides greater comfort and control. Chrome vanadium steel blade ensures greater hardness, strength, and durability. Chrome plated blade with magnetic tip. Soft rubber grip provides greater comfort and control. 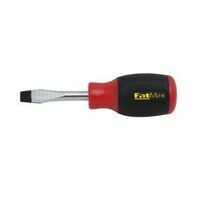 FatMax Screwdriver, Series: 62 Series, 3/16 in Point, Magnetic, Cabinet Point, 3 in Overall Length, Round Shank, 3 in Shank Length, 3/16 in Blade Diameter, Comfort Grip Handle, High Carbon Steel, Lacquer Coated, ANSI Specified Precision machined and sand blasted tip grips resists slip out that is heat-treated with lacquer coated bar that resists rust. Ergonomically designed tri-lobular handle provides maximum tip torque; slip-resistant rubber grip with tip identification symbol molded onto side handle. Precision machined and sand blasted tip grips resists slip out that is heat-treated with lacquer coated bar that resists rust. Ergonomically designed tri-lobular handle provides maximum tip torque; slip-resistant rubber grip with tip identification symbol molded onto side handle. Chrome vanadium steel blade ensures greater hardness, strength, and durability. Satin chrome plated blade with magnetic tip. Soft cushion grip provides greater comfort and control. Thumb stop allows for greater torque. Standard blade and tip with full size vinyl grip. Heavy-duty square shanks for wrench-assisted turning; boister reinforces shank for hard use; cushion-grip handles for greater torque and comfort; precision machined tips for exact fit; "Tip-Ident" quickly identifies the screwdriver type and tip orientation. Heavy-duty square shanks for wrench-assisted turning; boister reinforces shank for hard use; cushion-grip handles for greater torque and comfort; precision machined tips for exact fit; "Tip-Ident" quickly identifies the screwdriver type and tip orientation. Standard blade and tip with full size vinyl grip. Heavy-duty square shanks for wrench-assisted turning; boister reinforces shank for hard use; cushion-grip handles for greater torque and comfort; precision machined tips for exact fit; "Tip-Ident" quickly identifies the screwdriver type and tip orientation. 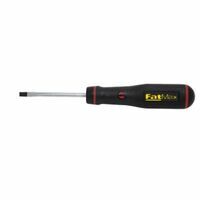 Heavy-duty square shanks for wrench-assisted turning; boister reinforces shank for hard use; cushion-grip handles for greater torque and comfort; precision machined tips for exact fit; "Tip-Ident" quickly identifies the screwdriver type and tip orientation.